Since the dawn of time, the spirits of nature created the Kamigakushi, a magical veil the hid them from the impure eyes of man. 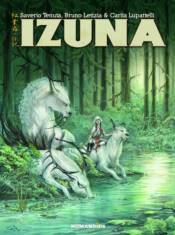 The Izuna wolves were entrusted as guardians of this invisible boundary against the evil spirits known as the Noggo. But the mysterious birth of a wolf cub in the shape of a young girl threatens to upset the delicate balance between the two worlds and plunge both sides into chaos.